We are excited to share some of what is coming our way in the months ahead. 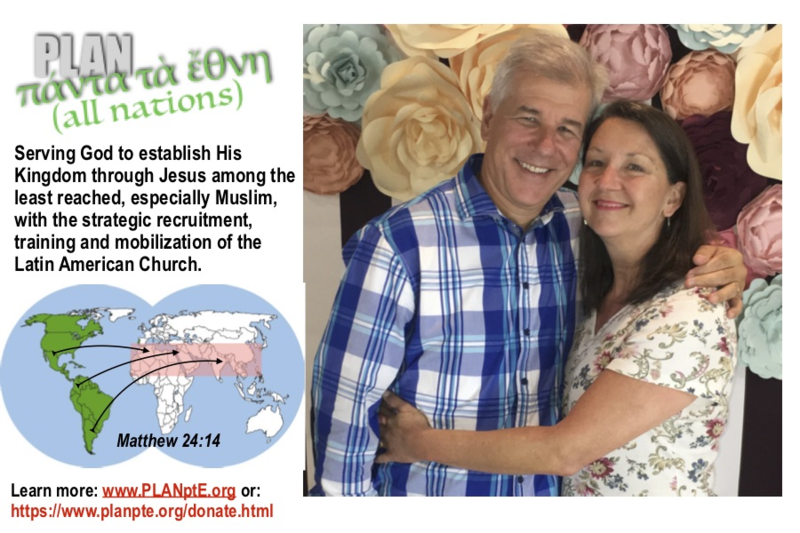 While we cannot presume upon God and His plans for us, we have been struck in the last few years at the number of invitations we've received from around Central and South America, not discounting the interesting increase in invitation for ministry to Northeast Africa and the Middle East. Primarily hailing from churches, seminaries, institutes and aspiring missionaries we have now made the leap to trust the Lord to lead us in dependence upon Him to assume leadership for what is a multi-cultural international community comprised of pastors, denominations, leaders and students committed to Latin American cross-cultural engaging of Unengaged Unreached People Groups around the world, especially those of Muslim orientation. These new developments have brought us to conclude, with the help of our Accountability Council, that a new vehicle is needed for accomplishing the mission God gave us back in 1987. It is a community called PLAN panta ta Ethne (clic here to learn more). PLAN panta ta Ethne has invitations from Uruguay, Paraguay, Venezuela, Colombia, Argentina, Brazil, Guyana, Costa Rica and Cuba while we additionally pray for God’s will in answer to dialogues from Northeastern Africa and the Middle East for what are being called "Bridge Ministries,” i.e, one or more ministries which may aid in facilitating the arrival of Latin American cross-cultural workers to that part of the world, “bridging" them, so to speak, into nearby Unengaged Unreached Muslim contexts. Raise financial and prayer support in order to accomplish these outcomes (clic here to learn more about our current financial outlook). Some are reminding us to be careful not to bite off too much as we begin our sixth decade of life; suffice to say we wish to work heartedly as unto the Lord with all the strength we have until the very end. Others speak of retirement, but we have no intentions of this. These objectives are very much in line with our lifetime call and we count it all joy to give the Lord our best.